The Pastor who made a cloth devil burst forth with firecrackers to have his catecheses understood by restless catechism youngsters; the Bishop who encouraged catechists and educators to communicate the joy of evangelizing, Evangelii Gaudium; the Cardinal who on the feast of Saint Cajetan challenged the political class in Buenos Aires to fight against the elite sick with ideology and who supported the population’s struggle for bread and work. The whole done always with a very precise “style”: looking straight into the eyes of the people listening to his preaching “because there must be nothing between the preacher and the people.” Not pre-packaged papers or texts but a direct dialogue, as Saint Ignatius taught. 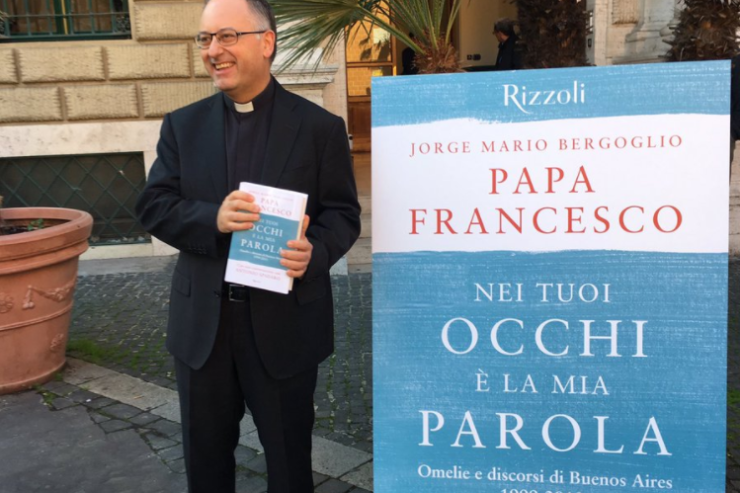 It is a new face of Jorge Mario Bergoglio, which emerges from the volume “Nei Tuoi Occhi e La Mia Parola,” edited by Father Antonio Spadaro, Director of “La Civiltà Cattolica.” Yet in the more than 1,000 pages that make up the volume, one can make out clearly the features of him who today is Pope Francis. Published by Rizzoli, the book brings together more than 200 homilies, messages and addresses of the Cardinal who for 14 years (1999-2013) was at the head of the Buenos Aires megalopolis and who, in the designs of Providence, was preparing to become Pope. However, it is not an anthology but rather an Opera Omnia of the then Archbishop of Buenos Aires, useful “to understand the ecclesial season that we are living,” as the curator himself explained during the presentation of the book on Thursday in the Jesuits’ General Curia. And it is in fact this direct thread that Bergolgio has always liked to establish with anyone who listens to his preaching, which is the aspect that this “big volume” highlights in the main, as Father Lombardi described it jokingly. For his part Father Arturo Sosa, elected last month Superior General of the Society of Jesus, revealed the aspect of Francis’ “universality,” “the first and perhaps last Jesuit pope of history.” His religious experience, united to his “pastoral practice” in the heart of Argentina, “trained” him to become a “broadminded” Pontiff but also capable of looking at the individual, he said.